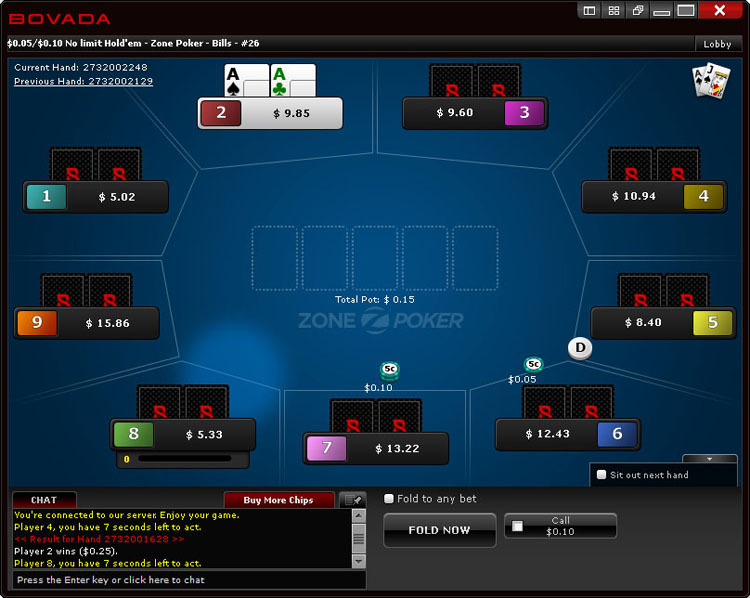 In August, 2013, Bovada just launched its own variant of the popular fast-fold format, Zone poker. When Full Tilt Poker pioneered this brilliant concept in 2010 by introducing Rush Poker, it won instant popularity and gradually became the game of choice all throughout Europe when other skins quickly followed suit. Now Poker Stars has Zoom Poker, PartyPoker offers FastForward, Ongame has Strobe, and MPN does Blaze. The fast-fold feature of the variant virtually eliminates the wait time for the start of a new hand after a hand is folded, which makes play a lot faster and more exciting. This is because as soon as you push the “fold” button – even before it’s your turn to act – you get seated at another table with a new hand dealt immediately. 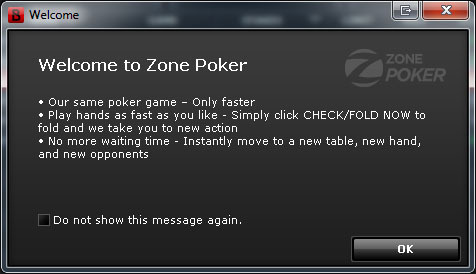 So, What Is It Like to Play Zone Poker? Action, action, action, action, action. The hands are dealt to you three to four times as fast as there is no need to wait for the whole table to contemplate their actions when you’ve decided to dump that 93 off-suited preflop. You go through hands at a kaleidoscopic speed and get to your dream holdings in no time, rather than waiting orbits upon orbits. Somehow, it feels like this is poker in its truer form, because this is where you can make your ranges truly shine and factor out the fatigue that comes from spending most of your time waiting. How Does Zone Poker Work? Instead of being confined to a single table, like in a regular game, you are placed in the pool of players that rotate. As players fold their hands, they are placed at new tables and action starts as soon as the table fills up. Zone Poker is now available at stakes from $.02 – $.05 up to $.50 – $1 in Hold’em and Omaha. The software keeps track of the blinds and assigns them relative to the most recent seating history in the pool. This, on average, works out to the same frequency of playing blinds (and other positions) as in the regular game. Do I Get the Same Poker Points for Playing Zone Poker? The point system works the same way as in a standard cash game, but you will be able to accrue points faster by the virtue of playing a lot more hands. Since players are at liberty of being more selective with their holdings, you would expect your opponents to enter pots with a lot stronger hands on average. Raises and three-bets will have a lot more meaning too. However, on the contrary it may mean more opportunities to steal blinds. All in all, it is still a poker game where sky is the limit to perfecting your ranges or soul-reading skills. And don’t forget about those good old heaters, which at the Zone speed may become even more pronounced. Let’s compare the pros and cons of playing Zone Poker and consider the anonymous aspect. We’ve already mentioned speed, with which come the higher adrenalin and the better, in our view, overall playing experience. Speed will also help smooth out the variance dips where your results will stay closer to your natural EV curve. That means you can detect your leaks and make adjustments quicker. You will also be able to accumulate points a lot faster, which is definitely a benefit. It is an entirely new format which may take some time to get used to, during which time you may, of course, end up losing some of your BR. We also have to remember that Zone Poker, as of this writing, is only about a week old and the player pools, although growing, are not yet big enough to produce instantaneous transitions from one hand to the next. Also, the fact that the players are being continuously shuffled among tables means that you won’t have a clue of who your next opponent is. You would have to reconcile with the idea that you cannot use your observational skills to your advantage as you won’t know who the opponents are nor will you know how they play their hands apart from the hands they’ve played against you. Hopefully this improves as the software evolves. 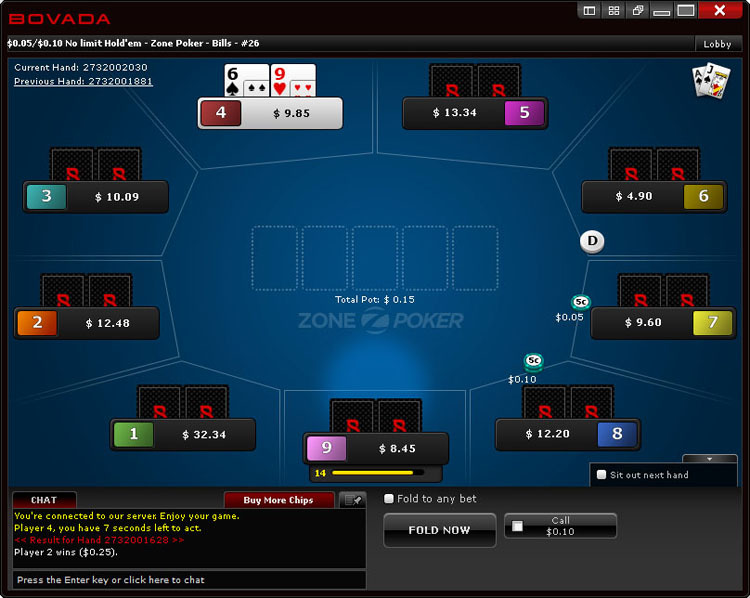 This is the blessing and the curse of not only Zone Poker but all of poker at Bovada. Put in place to promote fair play by taking away the opportunity to log opponents’ histories and create stats in order to take advantage of their play in certain spots. This is to the advantage of a recreational player, putting him on a more even footing with regulars and should be commended. On the other hand, players have no identities – you feel like you are playing a bunch of faceless seats, which takes away from the social value and that same recreational one. 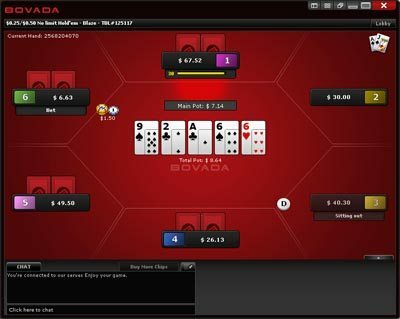 Love it or hate it, this is the unique quality of Bovada, which, however, did not stop it from being the most popular U.S. – facing site. I am Convinced, Where Do I Find It? Zone Poker is currently offered at cash tables at $0.05-$0.10 and $0.02-$0.05 stakes with plans to expand further. 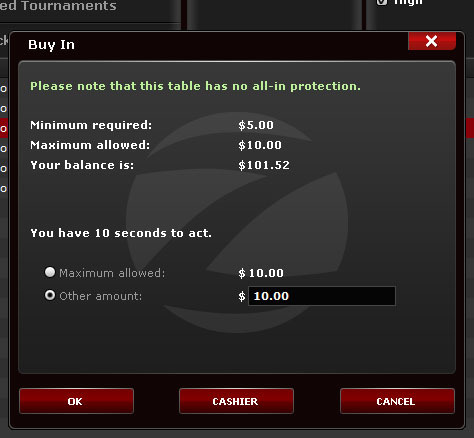 It has its own tab in Bovada Poker Lobby, see screenshot below. And we’re in! Pfft, let’s get rid of that 96o, I want a new hand NOW! And that’s it, just keep clicking Fold Now when you don’t want to play and you will see a new hand, almost instantly. As mentioned in the Cons section, there is a slight lag, which is hopefully improved upon in the future. But there is no question the game play is faster and definitely worth checking out! All new players who signup through FTR will receive a 100% up to $1,000 bonus on their first deposit! This bonus is clearing by playing real money poker games and earning Bovada poker points. With the fact in mind that at Zone Poker tables you can log your hands at two to three times the speed, you can rest assured that you will be able to claim your 100% bonus that much faster playing Zone Poker! More details on clearing the Bovada Poker bonus. 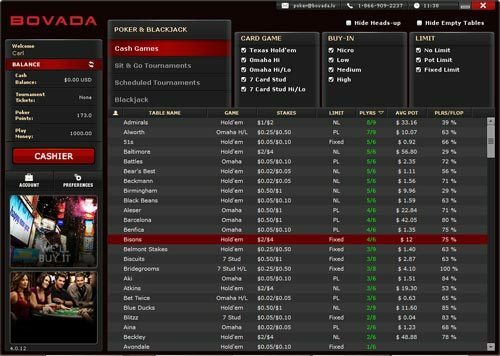 Learn more by reading this Bovada Poker review at GPSTS.org. Find more Bovada bonus codes at USA Casino Bonus Code.